This is week two in my joy series and, joyfully for me, I still have lots of things to talk about. Since Monday starts with an M, it seems logical to talk about movement. Or more specifically dance. I come from a family of dancers. My grandparents were competition ballroom dancers long before the sport was lampooned by Strictly Ballroom and ballroom dancers achieved the status of minor celebrities as judges on shows like So You Think You Can Dance and Dancing With The Stars. My mother is also a dancer. She's spent many years teaching people to tango, salsa and do the West Coast Swing (which is its own complete and distinct subgenre). In my family, it was not an uncommon occurence for the kitchen table to be pushed to one side during holidays. My grandfather would waltz me from one end of the room to the other in order to demonstrate a tricky turn or proper body positioning. From a young age, I knew all about things like reaching from the hip, keeping your chin up and the importance of posture. Until a few years ago I would answer that question vehemently in the negative. No. I am not a dancer. Maybe my rejection of dance has something to do with a basic flaw in my nature. When people tell me to go left, it makes me long to go right. If you tell me what I can't have I only want it more. If you tell me what I should do, I will dismiss it. Until I get there on my own. Because recently I've rediscovered the joy that is to be found in dance. And as if that wasn't enough, the ways a body can move and be positioned have seeped into other areas of my life. What is yoga, if not a slow elegant dance? Walking can be lyrical and running provides opportunities to leap over puddles and sashay under low hanging branches. I'll even admit to pushing aside the coffee table in the living room. The kids and I let loose in after school dance sessions where we move our bodies to the sounds of Pink Martini. There are no technical terms, no discussions of reach or posture but there is an undisputable amount of joy. My grandfather is no longer alive but I'm quite certain my recent love affair with dance will bring joy to my ninety-two year old grandmother. She's always insisted dance is the key to a happy life. I'm not sure if it's the only key but it definitely has a place on the key chain. I'm not a dancer myself, but love to watch those who can, and will admit, I love Strictly Ballroom. Love, love, *love* this post! Dance is in everything. Love your comparison with yoga being a slow dance. I totally agree. I danced with a professional company for 7 years and was a teacher for 14. Ballet was my WORLD until stopped to be at home with the kids. I was pretty depressed until I found writing. Now writing fulfills me just as much as dance did. Oh, Johanna what memories you have! Dancing is all about joy and expressing it through movement. It makes you feel good. My family didn't do dance competitively, but we love dancing. My parents were always dancing and I learned ballroom waltzing,tango, two step and swing from them. I also learned how to polka and jitterbug from mom and her mom taught me--or tried--The Charleston. I could never get the knee thing right, but it was a joy to watch my grandmother demo it. This morning, I amused my cats by turning up the music loud and dancing around the living room. Thor, my grey, will actually follow me around when I do. his form of dance? maybe or maybe concern for his crazy human and the fun of her long peasant skirts to play with, lol! No one in my family has ever been that coordinated. I envy your genes there. I like yoga though, and I do dance aerobics [badly] and pilates. I keep trying to do better and have become a little better coordinated. Maybe. But there is joy in movement. You're right. Ah, there's nothing like dancing! And yoga is so beautiful. I went out dancing with my husband a few weeks ago for the first time in years. It was so much fun. Oh bless, I love the thought of grandparents dancing. Sweet post, and I can't resist dancing to 'Sway', if thats on at a party, I'm swaying. Big time! Not a dancer -- at all. In fact, the only physical activity I can do with any grace is skiing. I do get joy out carving lovely sweeping curves down a mountain trail. I wish I could have been a dancer, except my feet are too flat and big. It would've been easier for me to wear clown shoes than ballet shoes. But I do like going to the dance classes at my gym, because at those classes everyone is still learning. I like watching old movies with ballroom dancing. They always look so elegant. Sounds like fun to me! What a wonderful thing to be joyful about. Tamara, I love that movie too. Angela, that's so cool. What kind of dance? Morgan, good we can obsess over SYTYCD together! M Pax, I think the joy piece is in the movement not how well you do it. Alison, that sounds like so much fun! Talei, grandparents dancing is sweet indeed. Dianne, I love making those sweeps down a hill too...as long as the hill isn't too steep or bumpy. Neurotic, I think that's the perfect venue to explore it. Well I'm not a dancer either so it's not all bad. You are doing something alphabetical after last month?? You must be a glutton for punishment! 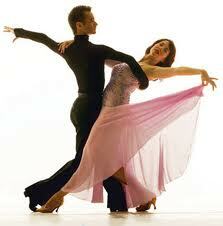 I also adore dancing, but I recently decided to stop my lessons because the instructor was wasting my time.